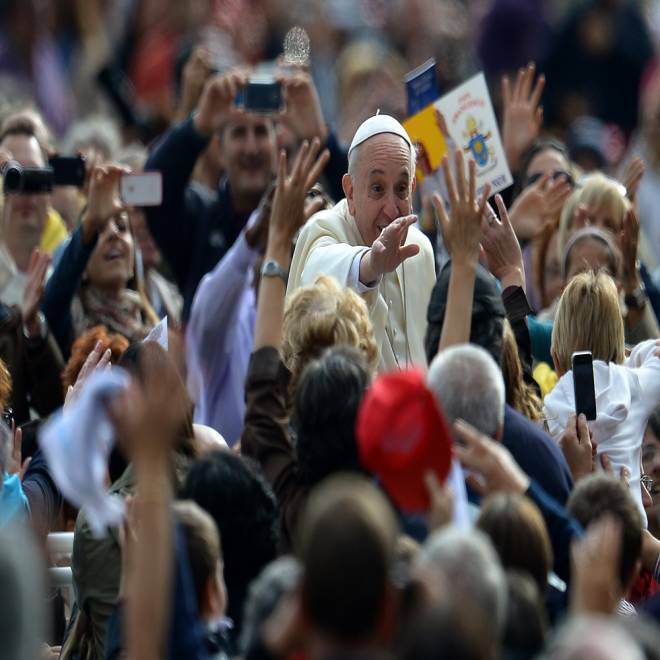 Pope Francis arrives for an open-air general audience at St. Peter's Square last week. Pope Francis' plain-spoken populism has won rave reviews, from people in the pews to the man in the Oval Office, but his pronouncements on everything from atheists to abortion have shaken some conservative and traditional Catholics. Six months after he was installed on the Throne of St. Peter, the pontiff's comments in a series of interviews are being denounced in scattered corners as "reckless" or even "borderline heretical." One critic called him "the Joe Biden of our era." "The whispers are rising," said Steve Skojec, 35, a father of six from Manassas, Va., who said a scathing blog post he wrote about the pope's recent remarks got 20,000 views, compared with the usual 500. "There are more and more people who are feeling uncomfortable." The skepticism rides behind a wave of praise for the down-to-earth Argentine — applauded for choosing Jesuit simplicity over Vatican opulence, emphasizing the poor and tweaking the powerful, and checking stridency at the door when talking about gay marriage, contraception or whether non-believers get into heaven. "Best pope ever" is a frequent appraisal on Twitter, and President Obama, a Protestant, told CNBC this month that he is "hugely impressed" by the rookie leader of the world's 1.1 billion Roman Catholics. The broad-based adulation — only 4% of Americans in a recent poll had an unfavorable view of the pope — is vexing pockets of conservatives who want a harder line on core doctrine and who worry that even if Francis has not altered church teachings, his words will be misinterpreted or exploited. "I'm very disturbed by these off-the-cuff, informal remarks," said Christopher Ferrara, a columnist for The Remnant, a Catholic newspaper that opposes many of the changes that accompanied Second Vatican Council in the 1960s. "In one sense, there's no harm because church teaching has not been changed, but in the other sense there is tremendous harm because not everyone understands church teaching," added Ferrara, who is drafting a letter to the Vatican requesting clarification on some of the pope's positions. Sign at an abortion clinic in Wichita, Kan. 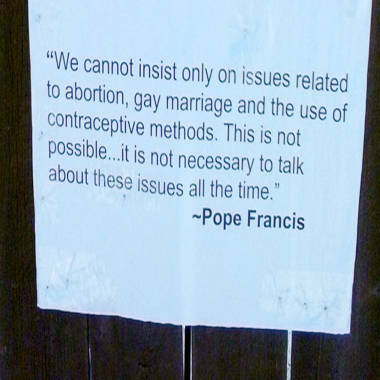 He pointed to a Kansas women's clinic that posted on its fence a quote from Francis — saying Catholics should not focus only on hot-button issues like abortion and contraception — as a rebuke to protesters. Julie Burkhart, director of the South Wind Women's Clinic in Wichita, said she put up the sign so "the people coming here to protest us and harassing our patients might pause and think about what else they could be doing with their time." David Gittrich of Kansans for Life shot back that the quote was "taken out of context" and that it was "ridiculous" for the clinic to suggest the pope wants to dissuade anti-abortion activism. Many rank-and-file Catholics and commentators, even those who consider themselves religiously conservative, say Francis is tinkering with style, not substance. But others are quietly nervous — or loudly aghast. “Is Pope Francis a wishy-washy spineless pope? Perhaps a pawn, to be used by the liberals inside and outside the Church?" asked the author of the Connecticut Catholic Corner blog, who declined to speak on the record. John Vennari, a traditional Catholicism advocate, put forth a conspiratorial view in a YouTube video, suggesting the pope's interviews are a way for him to get around writing encyclicals that would contradict church doctrine and the powerful Rome-based cardinals who would object to that. “He’s leaping over their heads just to take this revolutionary message just straight to the people,” Vennari said. Skojec said that because many people believe — mistakenly, he said — that anything the pope says is "infalliable," a pontiff has to be "very prudent and circumspect." Instead, he wrote, Francis has been "utterly reckless, theologically misleading, and borderline heretical." Fans of Francis have predicted that his gentler tone might bring lapsed Catholics and young people into the church, but detractors say it might drive away a certain brand of congregant. The Society of Saint Pius X, a breakaway group, said in a statement that the recent interviews had "provoked some new interest" in them and predicted membership would grow, "if the Holy Father confirms the direction he seems to be taking." Stephen Heiner — founder of TrueRestoration.org a member of the sedevacantist movement, which argues there hasn't been a true pope in Rome since Vatican II —said the number of people listening to his podcast doubled from about 4,000 to 8,000 in reaction to the pope's statements. "The fact that we, who could be considered fringe, are attracting listeners speaks to the discontent," he said. He added that Francis' language in the media interviews was "inelegant," in contrast to the formality of written communiques like encyclicals. "He's the Joe Biden of our era," he said. Jeffrey Tucker, editor of the New Liturgical Movement blog, said the super-traditionalists should relax, even though he admitted Francis left him unsettled at first because he is so different from his more formal predecessor. "All of us miss Benedict — we just do. It's kind of how the kids never like the new stepfather," Tucker said. "You get groovy with it and everything's OK. There's a group of traditionalists that just don't get it, and they're terrified." Boston College theology professor Thomas Groome said it's easy to see why reactionaries would be on edge. While the pope hasn't messed with doctrine, a shift in priorities and pitch is clearly underway, he said. "I think it will be a real test for conservative Catholics," he said. "They have always pointed the finger, quoting the pope for the last 35 years. Suddenly, will they stop quoting the pope. It'll be a good test of whether or not they're really Catholics."